PLEASE NOTE: This glossary is a work in progress and is being edited and added to all the time. Some links may not yet be active so please be patient. Literally 'algae seeker.' -A small simple microscope of moderate power designed to determine if a given sample of water contains diatoms or similar life forms. The term was first used by Edourd Thum who sold such devices, of cylindrical form and of at least moderate magnifying power. A lens system used above a specimen that has usually had polarized light projected through it. This upper system is usually oriented 90 degrees to the polarizer, thus blocking out all light rays not changed by the specimen itself. Without an anisotropic specimen, the field will appear black when both analyzer and polarizer are present and oriented 90 degrees from each other; this is known as extinction. Analyzers can form part of a special eyepiece (eyepiece analyzers), can take the form a removable extension of the nosepiece (nosepiece analyzers), attach to the end of a draw tube, or be integrated into the main optical tube, often with facility for throwing them out of the optical path. ANGLE OF APERTURE: The angular aperture of a lens is the angular size of the lens aperture as seen from the focal point. It is an indication of the resolving power of a lens; the higher the angle of aperture, the better the resolving power. The angle of aperture reflects a different degree of resolving power depending on the medium. An angle of aperture of 75 degrees in air does not imply the same resolving power as 75 degrees in oil. Numerical aperture is a related term that compares resolving power regardless of the medium used. ANIMALCULE(S): Microscopic life form(s), especially protozoa. ANIMALCULE CAGE: see Live Box. ANISOTROPIC: In microscopy, a material or specimen which changes the orientation of polarized light and is therefore visible between crossed polars. These materials are called birefringent. A device for measuring the numerical aperture of an objective. 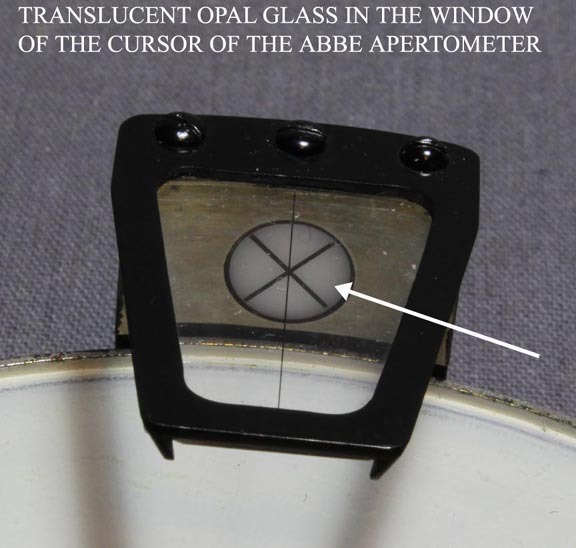 The Abbe apertometer consists of a special calibrated scale with adjustment that sits on the stage, and a special objective that screws on to the inside of the drawtube of the microscope. 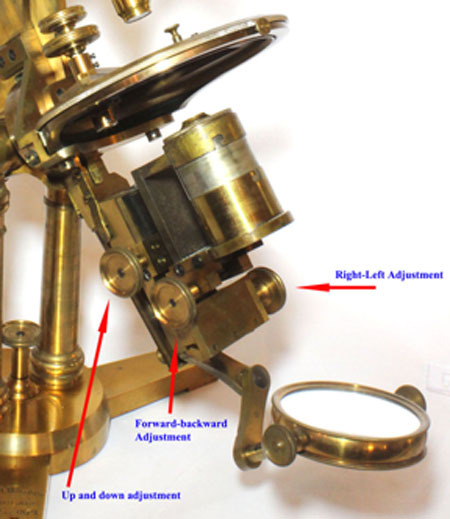 Note that use of this type of apertometer requires both parts; an alternative to the special objective is to use a phase telescope or a Bertrand lens to visualize the back (top)focal plane of the objective. There were many types of apertometer developed. Other simpler variations include the Cheshire type, and the Beck type. APLANATIC: A lens in which spherical aberration is eliminated by the use of compensating optics; should not be confused with flatness of field. Part of the limb of a microscope that supports the main optical tube. This term is usually used to refer to the part which is extending forward from the rest of the limb to hold the optical tube. The first synthetic plastic substance, was first made in the USA in 1907 and patented in 1909. In many respects Bakelite is superior to celluloid which preceded it. It was made from phenol and formaldehyde and came into wide use by 1910-25. It was sometimes used to make minor parts for microscopes like parts of eyepieces. The lens housing of the 'Seerite' tripod magnifier, made in the 1930's by the Testrite company, seen to the left, is made of Bakelite. Bakelite is highly resistant to solvents, is a very good insulator, and resists heat, but is very brittle and so breaks easily if dropped or subjected to physical pressure. In addition, extreme humidity can cause it to swell. 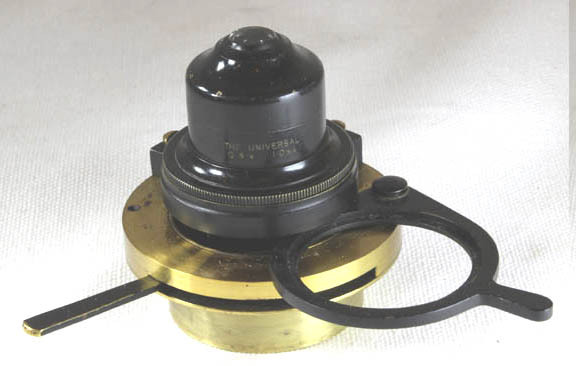 Bakelite was used for the distributor cap for the early VW Beetle, and for a time even for Jewelry. It was replaced by less brittle plastics starting in the 1940's. A limb which consists of a straight bar either attached to the stage, or driven by a pinion box attached to the stage, rising above it, with another straight piece attached to the top at right angles, projecting forward to support the optical tube. Bar Limbs were commonly made by both Ross and Powell & Lealand. A Bertrand lens is a lens which is usually built-in to a petrographic microscope. It can be thrown in or out of the field at will. In use, it sits between the objective and eyepiece. In this case its function is to allow viewing of the rear (top) focal plane of an objective to view conoscopic figures. In this way, it functions like a phase telescope but without the need to remove the eyepiece. 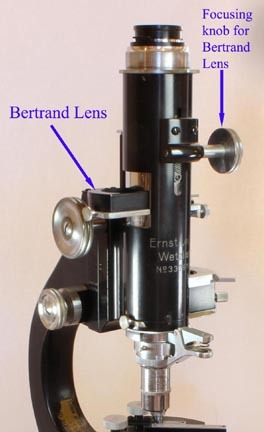 The Bertrand lens is somewhat more sophisticated than a simple phase telescope, and acts as a relay lens, transferring an image of the objective focal plane to the microscope intermediate image plane located in the eyepiece aperture diaphragm. A 'Between Lens' is a lens which is a lens first introduced into a microscope about 1710 by an unknown maker, possibly Edmund Culpeper according to T.H.Court. A microscope from that date (Bracegirdle 19/14) with this lens is in the collection of the Science Museum of London. This lens sits at the bottom of the optical tube above the single lensed objective, effectively forming a compound objective. This feature was re-introduced by Benjamin Martin in 1759 and it became a famous feature of his microscopes. 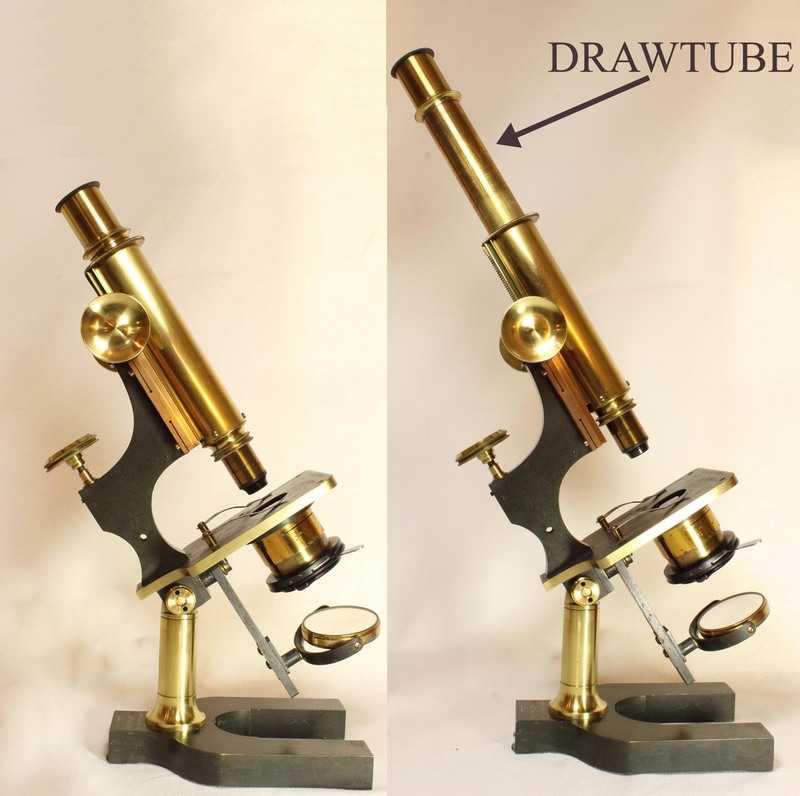 A drawing aid which, when attached to the eyepiece of the microscope, allows one to see an image of the object being studied superimposed on a drawing surface, thus making it simple to 'trace' the object. An Article Reviewing the Camera Lucida for the Microscope is now on this site. CAMPBELL DIFFERENTIAL SCREW: See DIFFERENTIAL SCREW. CAPILLARY TABLET: See LIVE BOX. CELLULOID:The first thermoplastic, first produced in 1856 (as Parkesine). It was made from nitrocellulose and camphor. It is clear but dies were added to change its color. It was widely used starting the late 19th century as photographic film and this continued until the middle of the 20th century when it was replaced by acetate film. It may have been used on some microscope parts, such as eyepiece parts, or as the housing for magnifiers. It is often colored, and it can sometimes be recognized by its pearly appearance when not too dark. Distortion of an image seen through an ordinary lens which results in loss of definition because light of each different color is refracted to a different focal point. This can lead to colored fringes or halos around the object. This effect is illustrated by the images to the left (courtesy of Dr Brian Matsumoto). The upper image suffers from chromatic aberration due to use of a non-achromatic condenser. By using an achromatic condenser, the image is markedly improved. A solid glass cylindrical but symmetrical biconvex lens with a V-groove cut in the center of the cylinder to exclude part of the aberrant light rays. The image therefore is seen with a lesser degree of spherical aberration, though not as little as the Hastings or Steinheil triplets, which have no stop in the center and are corrected for both chromatic and spherical aberration. The performance of the Coddington lens is generally superior to the Stanhope type. COMPOUND MICROSCOPE: -A compound microscope is a microscope which uses a lens or group of lenses close to the object being viewed to collect light (called the objective lens) which focuses a real image of the object inside the microscope. That image is then magnified by a second lens or group of lenses (called the eyepiece or ocular) that gives the viewer an enlarged inverted virtual image of the object. A device which, through compressing one glass plate against another provides an adjustable degree of pressure against a subject thus flattening it, or immobilizing, or partially immobilizing the subject, without damaging it. A livebox can be used as a crude compressor, but it is hard to make small adjustments to the degree of compression. Although Varley's original live box has a screw-on top, allowing fine adjustments, this method was abandoned as the twisting motion so applied often distorted the specimen. For this reason, later versions of his design have a press-fitting cap. A heavy compressor was used to flatten teased out fibers of meat to make them translucent, in order to inspect the meat for trichinella larvae. The process of meat inspection by this method was made a bit easier by partial digestion of the meat with enzymes. More recent methods completely digest the muscle and the parasites are found in the sediment, and are examined with a stereomicroscope without the need for a compressor. The article on compressors on this web site illustrates many forms of compressors and how they work. CONDENSER: An optical element or group of elements used to concentrate light from a mirror or other light source so that the light is focused on the specimen. There are two classes of condenser, the bullseye condenser, used mainly for illuminating opaque specimens from above, and the substage condensers for illuminating transparent and translucent objects from below. A conoscopic figure or interference figure is a pattern of birefringent colours crossed by dark bands (or isogyres), which can be produced using a petrographic microscope for the purposes of mineral identification and investigation of mineral optical and chemical properties. In this configuration, a Bertrand lens is interposed between the eyepiece and the objective, to view the rear (top) focal plane of the objective. This could also be accomplished using a phase telescope in place of the eyepiece. This type of limb, originally popularized on the European mainland, was commonly made by the French and the Germans. The main characteristic of this type of limb, is a Pillar serving to support the optical tube. This pillar classically arises from the stage itself and has an inner support (often triangular) over which the outer support(usually cylindrical) rides. 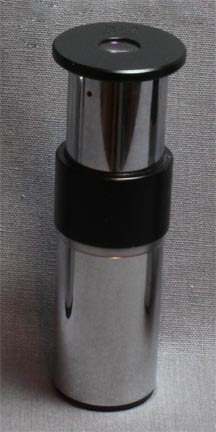 A knurled knob at the top of this outer tube is the fine focusing mechanism. The arm attaches to the top of the pillar projecting forward to support the main optical tube. British and American makers eventually added the Continental limb to their range of models. See, for example the Bausch & Lomb CCDS. 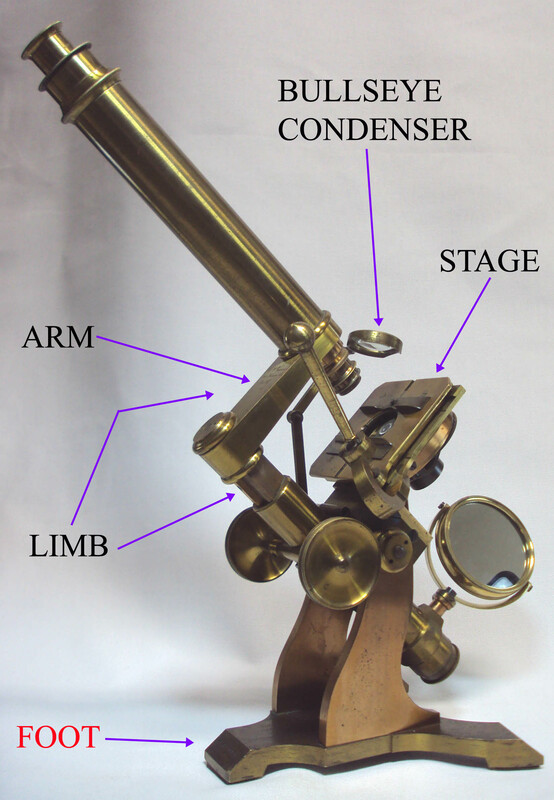 Since the term 'Continental' refers to the European continent, many simpler pillar-supported microscopes made on the Continent are also appropriately called 'Continental Limb' as long as they do not fit another style (such as Cuff-type). An adjustment device on some moderate to high power objectives to compensate for variations in the thickness of cover slips. This device, usually calibrated, is the chrome-finished part surrounding the objective on the left; it was required in the past because of great variation in the thickness of coverslips. It is a device seldom used today, though highly corrected objectives are often equipped with one because coverslip thickness still varies slightly and the optimal correction lessens spherical, and to a lesser extent, chromatic aberration. The correction collar adjusts the spacing of the optical elements in the objective for optimal correction of spherical aberration which is affected by cover slip thickness. Although cover slipthickness is now 'standardized,' standard <cover slips can still vary a little bit, and for very critical work special high precision-thickness coverslips are available (at additional cost). For ordinary work, just using the standard coverslip thickness that the objective is rated for is usually sufficient. For extremely critical work, objectives with correction collars are still available. The idea of a correction collar dates back to work by Lister and Ross. Once Lister had developed the theory of how to correct spherical and chromatic aberrations, he realized that the distance between the front element and the back elements of the objective would need to be different depending on the thickness of the coverslip. Ross came up with the idea of an adjustable distance between the fron and back elements, and constructed objectives that allowed this distance to be varied. It is uncertain when Ross first made these adjustable fronts. Ross published the first description of the correction collar in 1837, but earlier examples than shown in his publication were likely produced before that. The first type simply consisted of a outer collar holding the front element which slides over the inner barrel housing the other elements. Clamping screws were used to fix the optimal distance once determined. This design poses three problems. One is that it is easy to disturb the specimen and the alignment of the elements when simply pushing or pulling the outer collar. The second is that the focus to the specimen had to be changed with the change of the front element position which neccessarily moved the front element closer or further away from the object being studied. Third, moving the front element carelessly on a high power objective could cause it to crush the coverslip and specimen, not to mention the front element of the objective. His improvement in the arrangement as published in 1837, made the adjustment more precise utilizing a knurled knob around the objective. This did not solve the above problems though. A later and more satisfactory arrangement, first introduced by Francis Wenham about 1855, was to build a system into the interior of the objective that moves the back elements away from or closer to the front elements-a much more satisfactory design which was quickly adopted. See also the article on correction collars. A thin piece of material, previously mica, but, starting in the 19th century, glass, used to cover a liquid or preserved specimen on a microscope slide. Mica covers were referred to as 'talcs.' Coverslips were, (and are still) made in circular, square, and rectangular forms and came in different sizes. Most modern standard objectives specify 0.17 mm thickness glass coverslips; these are commonly called number 1.5. It is a common mistake to use number 1 coverslips with objectives rated for the 1.5. This will not affect the image much at low power, but the higher the power, the greater the effect on the clarity, and therefore resolving power, of the objective. CROSSED POLARS: using a polarizer and analyzer with their optical axes oriented 90 degrees to each other resulting in a dark background unless an anisotropic specimen is in between them in the field of view. A glass of lower refractive index and lower dispersion, than flint glass. A combination of a plano-convex lens of crown glass cemented to a biconcave lens of flint glass is the classic way to reduce axial chromatic aberration. Crown glass was the earliest form of glass. Its main components are silicon dioxide (sand), and soda lime (a mixture of calcium hydroxide and sodium hydroxide). One modern source quotes the refractive index of crown glass to be 1.52 to 1.62, and that of flint to be between 1.57 and 1.75. DARK GROUND ILLUMINATION: previously Dark Field. 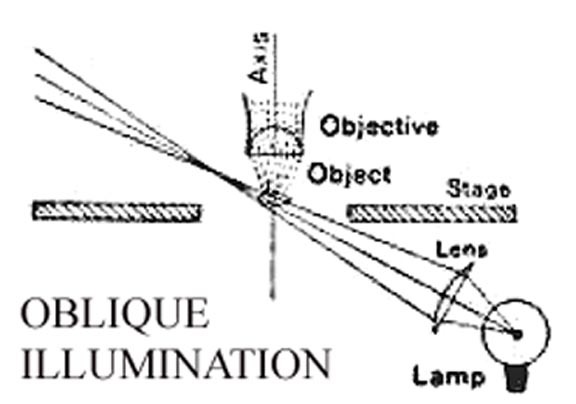 A method of illuminating an object only with oblique light from all sides, so that only the objects being studied will be seen against a dark background. At low magnifications this requires only a simple central stop below the stage. At high power, special dark ground condensers and other equipment are required. For more about Oblique as well as Dark Ground Illumination, and the history of the methods, see my article about the History of Dark Ground Illumination on this web site. A small cylindrical container device for holding an opaque object on or in the center of the stage. They are painted black inside to avoid reflections. The device must be used with downward or vertical illumination. Shown to the left are three darkwells of different diameters, designed to be held in place with an adapter such as that shown. This mechanism was used in Baker's Nelson (Nelson-Curties) models for fine adjustment. It was also used in some of Swift's microscopes. It uses a screw with two different pitches,(S and T), one finer than the other. The coarser end is threaded through the fixed end of the limb and the finer one drives the focusing mechanism. Because the movement of the part attached to the finer thread, is equal to the difference in the pitches, a very fine and precise movement can be achieved in a structurally strong design. Although the Rev J.A. Campbell's name is attached to the use of the screw on Nelson-Curties microscopes, he did not invent it, as it was used by machinists for many years before, but rather he suggested its use for fine focusing. See: Wikipedia contributors. "Differential screw." Wikipedia, The Free Encyclopedia. Wikipedia, 10 Sep. 2017. Web. 24 Jun. 2018. In optics, the separation of light by glass, into individual components of different colors (wavelengths). This effect is easily seen with a prism, but all glass, regardless of shape, has a tendency to cause this effect. Glass of lower dispersion reduces chromatic aberration. A telescoping tube inside the main optical tube of a monocular microscope. When present, it carries the eyepiece on its near end. It is used to vary the mechanical tube length. It is often threaded on the distal end to accept an accessory such as erecting lens or an accessory magnifier to view the rear or top focal plane of an objective. Some draw tubes are calibrated in mm and or inches to indicate the tube length. In some top of the line microscopes, instead of simply being pushed in or pulled out they were controlled by rack and pinion; these were sometimes called mechanical draw tubes. EPISCOPIC ILLUMINATION: Illumination of an object from above as opposed to transmitted illumination through the specimen. Also see Top Lighting. EYEPIECE: (also an ocular) A lens or set of lenses of a microscope nearest to the observer during actual use. In a compound microscope, it magnifies a real image formed by the objective lens to form an enlarged virtual image. EYEPIECE MICROMETER: An eyepiece with a scale visible in the field of view, used to measure the size of objects seen under the microscope. Two main types are the Jackson type and the Ramsden type. 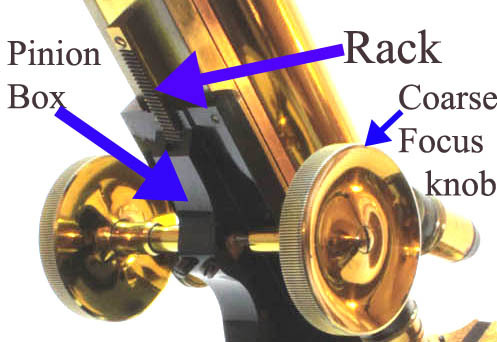 In the Jackson type, a slit in the side of the eyepiece admits a slider containing the scale engraved on glass. In the Ramsden type, a dial controls a cursor that moves over a scale, either of metal or of glass. The original cursors were made of spider web, but later wire and still later engraved on a second piece of glass riding over the scale. FLATNESS OF FIELD: when one area is in focus, the rest of the area in the same plane being observed is in focus from edge to edge. NOT the same as Aplanatic. A glass of higher refractive index and higher dispersion, than crown glass. A combination of a plano-convex lens of crown glass cemented to a biconcave lens of flint glass is the classic way to reduce axial chromatic aberration. Ingredients to make flint glass differ from those to make crown glass, in that lead, potassium, or a similar element is added to the sand (silicon dioxide) used to make it. This is usually in the form of lead silicate, potassium silicate, or another similar molecule. One modern source quotes the refractive index of crown glass to be from 1.52 to 1.62, and that of flint to be between 1.57 and 1.75. FOCAL LENGTH: The distance from the objective to the subject being studied when the object is in focus; in general the shorter the focal length of a lens, the higher the magnification. The base of a microscope; several varieties exist including the classic 'horseshoe', 'English or Crouch type', and both Raised and flat tripods. The horseshoe foot was invented by Edmund Hartnack in the early 1860's and became a standard type of foot from the late 19th century. It remained a standard form through the first half of the 20th century and beyond. 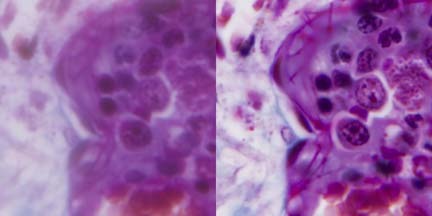 Student microscopes continued to use the horseshoe foot in the third quarter of the 20th century. A cone shaped device limiting the internal aperture of a dark field objective. In use, the device is dropped into the rear opening of the optical part of the objective to provide a reduction of the field of view to eliminate stray light from interfering with the dark background. This device is not needed in objectives which have a built-in iris diaphragm. In the example shown to the left, the chrome part is unscrewed from the brass part and the funnel stop is dropped into it, so that it restricts the aperture at the top of the optical elements. In this example all the optical elements are housed in the lower chrome portion of the objective, so the stop must be placed in that part in order to reach the rear or top end of those elements. GERMAN SILVER: see Nickel Silver. 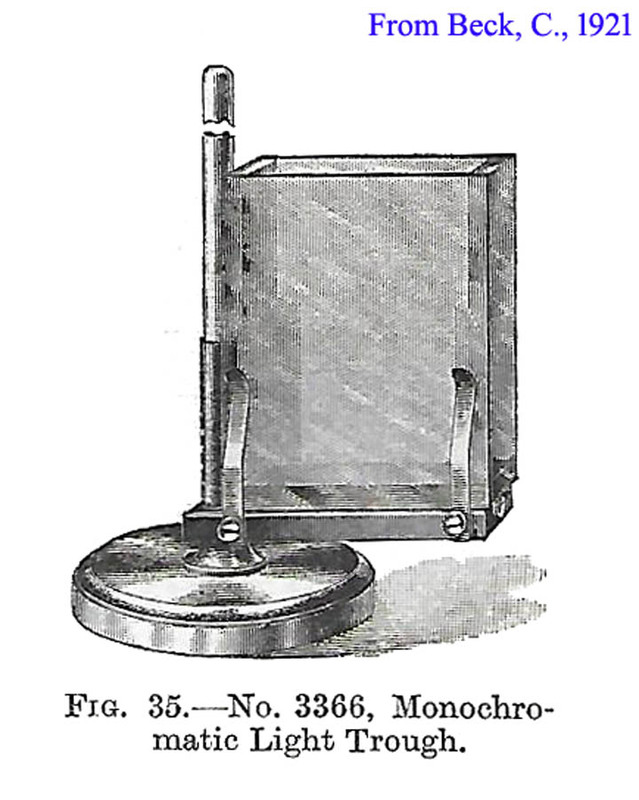 A device composed of a glass trough on an adjustable stand designed to act as a filter to produce a uniform monochromatic light source for the microscope. The trough is filled with a chemical combination known to filter out all but the desired color. Sometimes a thin piece of glass was added inside the trough to improve the purity of color. A simpler device was one holding a simple glass filter such as the Swift 'Light Modifier'. But to create a pure monochromatic light using a simple glass filter required such a thick piece of glass, that the brightness was greatly reduced with the lighting available in the early 19th century. This is why Gifford's screen was invented. A special slide usually used to study tiny moving creatures without any pressure applied to them. When using a lying drop slide, a very small 'drop' of liquid is applied to a coverslip. The coverslip is then turned over with the drop 'hanging' down over a special cavity slide. The microscope is then focused in the usual way from above. If the bottom of the cavity is sufficiently close to the bottom of the slide, a condenser can be used to greatest advantage, allowing use of even high power objectives. One disadvantage of this arrangement is that the drop is distorted hanging by gravity and therefore some distortion of the image or need to frequently refocus when repositioning is required. The lying drop slide has advantages over the hanging drop in that the drop is not as distorted and therefore the medium is more uniform and refocusing is not required when moving the slide, only when observing the subject(s) at a different depth within the 'drop'. HARD RUBBER: Formerly known as Vulcanite or Ebonite is a very hard rubber first made by Charles Goodyear, and patented in 1844. It is made by vulcanizing natural rubber for prolonged periods. Besides natural rubber, it contains about 25–80% sulfur and linseed oil. 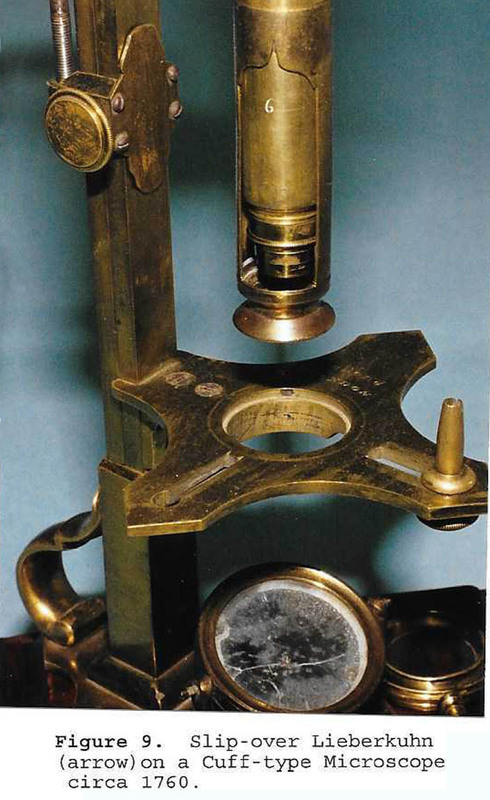 Hard rubber was often used by microscope manufacturers to cover the top of the microscope stage, especially by Bausch & Lomb, who also made other parts out of the material such as condenser housings, eyepieces, etc. Color could vary from black, as in Ebonite, to brown. For an example of a fancy hand magnifier made of this material see the Bausch & Lomb hand magnifier made of this material in this collection. HASTINGS TRIPLET: One type of simple microscope lens which is composed of a combination of three lenses cemented into a single unit which provides achromatic and aplanatic magnification. The central element is biconvex and the two outer elements are convex-concave.There are slight differences between a Hastings and a Steinheil triplet. IMMERSION: using a liquid medium between the objective and the subject, eliminating the air-glass interface and thereby, when properly designed, improving resolution and reducing aberrations. Various forms of immersion have been developed, using water, oil, and glycerin, as examples. Today oil immersion is commonly used, water only for special situations. A Lister limb in which the limb continues beneath the stage to accept the substage accessories. KEROSENE: also known as paraffin oil(England), paraffin(England), or coal oil(archaic: U.S.A.), the oil mixture that made oil lamps easier and safer to use, and was commonly available starting about 1860. It is a mixture of 6-16 carbon molecules obtained from the fractional distillation of petroleum. Almost all oil lamps were powered by this after about 1860. This is a system named after its inventor, the famous German optician August Kohler, which is designed to achieve optimal illumination while minimizing glare, distortion, and extraneous reflections which would degrade the image, especially during photography. 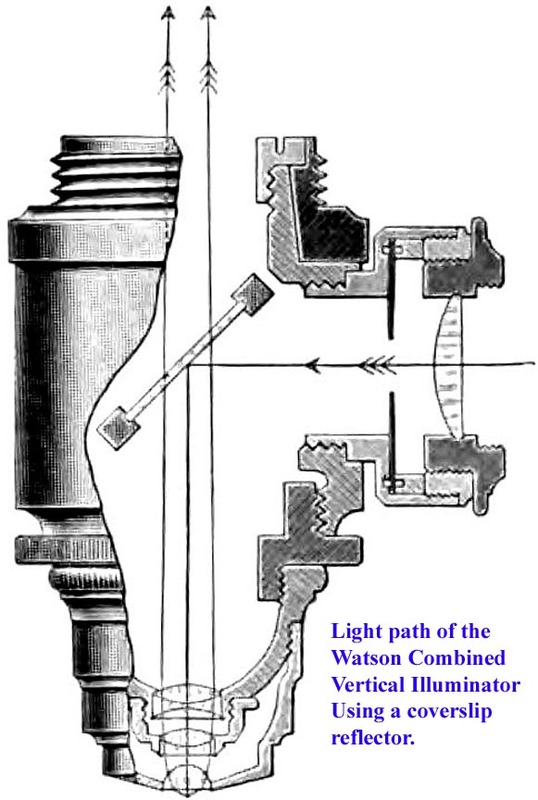 In order to achieve proper Kohler illumination, two iris diaphragms, a focusable condenser, and the ability to center the light source as well as the condenser are required. The ability to vary the distance of the light source from the condenser is also sometimes needed. Kohler illumination is also important when optimizing the use of phase contrast or interference contrast illumination. If you want to get the most out of your microscope, it should be capable of Kohler illumination. A stage controlled by a lever to allow one to easily follow a moving object. Two main types are known; the White lever controls the stage from above, while the Varley type controls the stage from below. Both were invented at about the same time. Often both types of lever stage are refered to as 'Varley' stages but this is inappropriate and unfair to the inventer, as White invented the above stage form. Some later inexpensive stages controlled by levers are simplified and less convenient to use than the original version by White. LIGHT MODIFIER: Early on, an apparatus to regulate the light source being used with a microscope so as to increase resolution and brightness. Such an apparatus was that by Rainey. Later, it refers to an apparatus to modify the light source to supply monochromatic light for higher resolution microscopy and especially photomicrography. These used colored glass, colored liquid, or combinations of both. Examples of the latter include the Gifford screen, and the Swift Light Modifier. 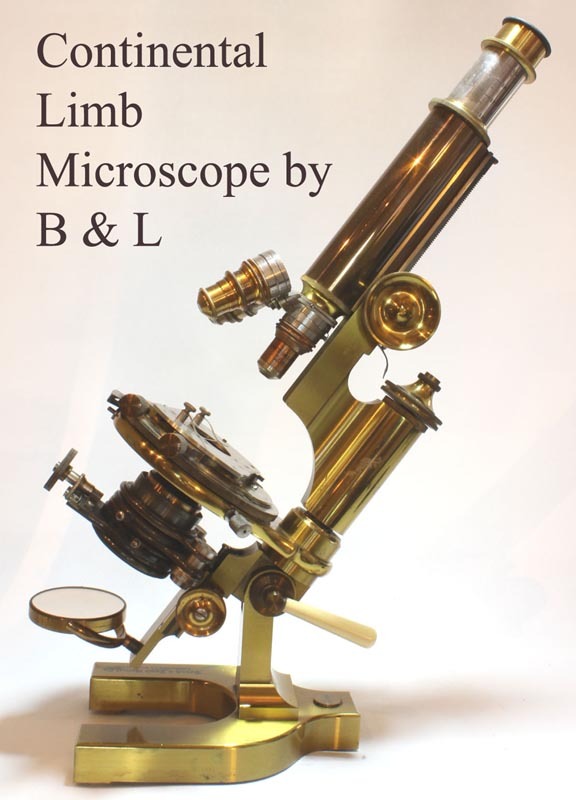 LIMB: The main part of the microscope which supports the stage and optical tube. Generally there are three main types. These include the Lister Limb, Bar Limb, and Continental Limb.A further improvement in the Lister limb is known as the Jackson or Jackson-Lister Limb; in this case the limb continues as a solid piece of metal to below the stage to carry the substage parts in line with the optical axis. LISTER LIMB: A limb which is based on the design of Joseph Jackson Lister. The basic construction features a single solid piece which is the support for both the optical tube and the stage. The Jackson Limb is similar except for the extension of the same piece of metal to below the stage to support the substage. LIEBERKUHN: A reflector which surrounds an objective and allows vertical illumination of an opaque object by reflection of light coming from underneath the stage. This was the earliest method of vertical illumination, though a bullseye condenser could concentrate lighting from above at an angle. The latter technique cannot be used to illuminate opaque objects when using objectives of short focal length (high power). Used by Van Leeuwoenhoek in the early 1700's, but popularized in the mid-late 1700's by Johann Lieberkuhn. With this device, the light source from beyond the object passes around it and is reflected back down upon it by a polished mirrored parabolic surface that surrounds the objective. The chief limitation of this technique is that the object must be small enough to allow the light to pass around it, and this is often not the case, especially for large metal samples etc. A glass-enclosed chamber to restrain a subject, often in liquid. Some forms of live box can serve as a compressor, others are simply an enclosed chamber. Dedicated compressoria are more easily used as compressors than live boxes. Cornelius Varley made a major improvement in the live box by creating a trough around the edge of the glass surface on which the subject was placed. An example of his live box, which he called a 'Capillary Tablet' or 'Cage' is shown on this web site. An article discussing the history and types of livebox is available on this site. LOUPE: A handheld magnifier, usually without a handle and of higher power and smaller diameter than a magnifying glass. Different types of lenses can be used as loupes including Coddington lenses, and Triplets. In use, Loupes require the user to bring their eye close to the lens to properly see the image. A special slide usually used to study tiny moving creatures without any pressure applied to them. The traditional method is a hanging drop slide. With the lying drop slide, an inverted optical path is required, such as with an inverted microscope or a McArthur type microscope. In this type the liquid simply rests on a coverslip at the bottom of a hole in the slide. The objective, pointing up from beneath allows visualization through the coverslip. The lying drop slide has advantages over the hanging drop in that the drop is not as distorted and therefore the medium is more uniform and refocusing is not required when moving the slide, only when observing the subject(s) at a different depth within the 'drop'. MECHANICAL STAGE: A stage that allows movement of the subject, usually on its glass slide, that is controlled for fine movements by knobs or other controls, most commonly via rack and pinion or worm screw. Mechanical stages were often built-in, but many attachable varieties were also made. These simply clamped on to the pre-existing plane stage after the stage clips were removed. MONOCHROMATIC LIGHT: Light of a single color (wavelength). NICKEL SILVER: Also called German silver, or electrum, is a special type of brass alloy composed of copper,nickel and often zinc. The usual formulation is 60% copper, 20% nickel and 20% zinc. Nickel silver is named for its silvery appearance, but it contains no elemental silver unless plated. The name "German silver" refers to its development by 19th-century German metalworkers in imitation of the Chinese alloy known as paktong. Nickel silver quickly forms a duller appearance than nickel plating due to oxidation. 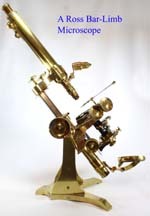 For an example of an instrument made of nickel silver, see the Browning Miniature Microscope on this site. NELSONIAN ILLUMINATION: Also known as critical illumination. This method of adjusting illumination was first ascribed to Edward Miles Nelson in the late 19th century. It requires a perfectly uniform light source such as a good flame or an electric ribbon filiment. Using this kind of illumination, the light source is focused in precisely the same plane as the subject being viewed. To do this requires very precise focusing of the condenser, hence the need for a substage fine focus. Such mechanisms were supplied either as standard equipment or options on such stands as the Grand Van Heurck, the Royal and of course the Nelson-Curties model. where n is the refractive index of the medium between the objective lens and the coverslip and m is one half of the angular aperture of the lens. For air, (dry objectives), n=1.0. The higher the n.a., the better the resolution and the higher the magnification that will allow more details to be seen. A high power objective with a low n.a. will not show any more detail than a lower power objective with the same n.a. This failure of a higher power objective with a low n.a. to improve detail is often referred to as 'empty magnification' and is common with high power non-achromatic objectives. Numerical aperture can be calculated for any given objective when the optical design of the objective is known. It can also be measured directly with an apertometer. OBJECTIVE: The lens or group of lenses nearest the object being studied with a microscope. Illuminating a subject only with light rays directed from an oblique direction so that only light reflected by the objects on the slide will be directed towards the objective. Oblique illumination differs from dark ground illumination in that the oblique rays illuminate the object from only one direction; in Dark Ground illumination, the oblique light comes from all sides of the object. PARCENTRIC:Refers to the fact that, after changing an objective, the object being studied is still in the center of the field. All high quality microscopes eventually had this feature. PARFOCAL: Refers to designs of objectives which allows objectives of different focal lengths to be in focus without the need to change the coarse focus of the microscope once one parfocal objective is in focus. Phase contrast is a type of microscopy employing an optical mechanism to translate minute variations in the phase of light waves(invisible to the naked eye), into corresponding changes in amplitude, which can be visualized as differences in image contrast. This allows details that would not otherwise be visible with ordinary transmitted light microscopy to be easily and quickly visualized. Phase contrast utilizes a special condenser and special objectives. There are phase plates in the condenser and a phase ring visible at the back focal plane of each objective. For the technique to work properly the rings must be aligned. A small accessory eyepiece to view an enlarged image of the rear focal plane of the objective called a phase telescope is used for this purpose. A phase telescope is a special device that takes the place of the eyepiece and allows the user to focus on an enlarged image of the back focal plane of the objective to align the phase ring of the objective with the phase plate of the condenser. A Bertrand lens, when present, may also be used for the same purpose, but is usually found only on petrographic microscopes equipped for polarized light obervations. Occasionally a Bertrand lens was made as an attachable accessory between the main optical head of the microscope and the body tube below. PLANO or PLANAR: Flatness of field; when one area is in focus, the rest of the area in the same plane being observed is in focus from edge to edge. Not to be confused with Aplanatic. POLARIZER: An optical element fitted below a specimen which project polarized light on the specimen. The polarizer is often an integral part of a polarizing condenser. A projection eyepiece projects the image as seen through the microscope onto a paper, screen or the imaging plane of a camera. This accessory generally requires a strong light source for the microscope, which was not easily available until the advent of the Carbon Arc Lamp late in the nineteenth century. Solar microscopes were generally used for this purpose until strong artificial light became available. Early versions used a prism, while later versions used lenses to project the image optimally. An example of a version from the early twentieth century is the projection eyepiece by Watson. A mechanical arrangement for moving a part in a controlled fashion, making use of a gear (pinion) controlled by a knob, acting on a toothed part (the rack), attached to the part being moved. The most common use of this is in the Coarse Focus control of most compound microscopes. Initially the rack and pinion were both cut straight, but eventually a diagonal rack and a diagonal pinion were used to increase the accuracy of the movement. This use of the diagonal rack and pinion for the microscope was first introduced by James Swift in England. Racks and pinions were also often used to drive the substage, and often, also the mechanical stage. Mechanical stages became more important because as the magnification increases, the field of view becomes so small that slight movements are required to adjust the location of an object but without moving it outside the field of view. 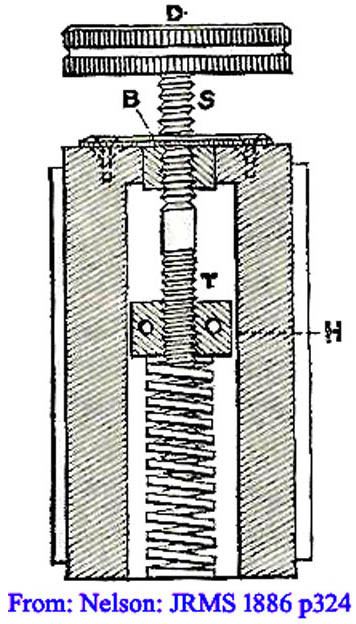 The pinion was often contained within a pinion box often with adjustments to keep the pinion's contact with the rack optimized. When a light beam passes from one medium to another, or near the edge of an object, its tradjectory is changed. This effect is called refraction. The refractive index of any medium is the ratio of the phase velocity of the light waves in a vacuum to their phase velocity in the medium itself. The refractive index allows comparison of this effect from one medium to the next (as in comparing two types of glass). In general, mediums with higher refractive index have higher amounts of dispersion. The ability of an objective to resolve details, usually expressed as a distance between two points or alternatively by the related term, Numerical Aperture. Without an increase in resolving power (resolution), increased magnification serves no purpose as the image would be increasingly distorted with the increase in magnification. This is termed 'empty magnification' and was common with use of higher power objectives in early (pre-achromatic) microscopes. Shagreen, as now defined in the world of antique microscopes, is a decorative firm material often used as a wrap-around covering of the body tubes of antique microscopes and telescopes. This material is derived from the skin of a ray. Its surface is covered with pearly circles. Ray skin in its original state is quite rough. However after the skin has been treated and dried and polished to a high gloss, it leaves the appearance seen here. The final shagreen was often dyed. The most common color used for microscopes was gray, followed by red, green, and blue. In the image to the left the outer tube is covered in gray shagreen; the inner tube is covered in dyed vellum. See the page on history of Shagreen for more details and history. Sharkskin, as defined in the world of antique microscopes, is hard rough surface derived from the skin of a shark. Its surface is pitted and the pitting may either be smoothed or rough and abrasive. The simple microscope case shown here is covered in sharkskin which is pitted but not abrasive. See the page on history of Shagreen for more details and history. A simple microscope is a microscope that uses a single lens, or a set of lenses in close proximity, to enlarge an object through angular magnification alone, giving the viewer an erect enlarged virtual image. The image is erect, and if more than one lens is used, the virtual image of the first is simply enlarged, unlike in a compound microscope where the second set of lenses focuses on the projected real image and the resulting image is inverted unless a special image-erecting system is used. This type of microscope is relatively limited to low to medium power magnification before aberrations limit its usefulness. Van Leeuwoenhoek's most powerful simple microscope magnified 250X whereas compound microscopes easily reach 600X and with oil immersion 1200X or even more. A flat device on which specimens are placed for study. Starting in the mid-19th century glass slides were most often a standard 1 x 3 inches, but before this, and sometimes later, especially for cheap commercial slides, smaller slides were used. Even earlier, bone 'sliders' were most commonly used. These could be made either solid with slight depressions, or with holes for transparent objects. Opaque objects on bone sliders were usually not covered. Transparent objects shown on bone sliders were mounted on tiny pieces of mica and covered with these as well, the top talc held in place with a springy piece of brass wire known as a 'circlip.' Early on specimens mounted on glass slides were also covered with mica 'talcs,' soon thin glass cover slips were used. Although modern slides usually have a label, Victorian glass slides often are covered in paper with the subject name either written on the paper or an attached label. Some relatively early Victorian slides are simply labeled by engraving them with a diamond. An instrument which uses the bright light of the sun to project the image of a microscopic subject onto a wall. Blurring of the image with loss of resolving power, resulting from the fact that parallel light rays passing through the curved surface of a simple lens are refracted to different degrees depending on their distance from the central optical axis. These different rays then reach focus at different distances, leading to a blurred image even at best focus. The effect is worse at higher magnifications. This occurs because the thickness of a biconvex lens is greater in the center and progressively thinner towards the outer edges. In the images shown, the one to the left illustrates the effect of spherical aberration, while the right shows the improvement with aplanatic optics. The flat surface of a microscope on which the specimen is placed, usually on a slide. STAGE CLIP(S):A device usually in pairs, that holds the slide on the stage, putting slight pressure on it from above. A microscope accessory for holding an opaque or three dimensional object over the stage of a microscope. STAND: The main components of a microscope which sits on a table. It does not neccesarily include the optical parts like objectives, eyepieces, etc. The term is not usually used for hand-held microscopes without a support for use on a table. A cylindrical lens with each end convex, but unequally, with the lesser curved lens being placed on or very near the object being studied. This lens is not as free of aberration as the Coddington and has a very small field of view. One type of simple microscope lens which is composed of a combination of three lenses cemented into a single unit which provides achromatic and aplanatic magnification. The central element is biconvex and the two outer elements are convex-concave. There are slight differences between a Hastings and a Steinheil triplet. Patch stops, or simply stops, are solid disks which block the central light rays of a condenser or light source. They are usually supported by a spider frame with two or three struts, which fits into the swing-out filter holder of a condenser. In some condensers, like the Powell & Lealand High Power Acromatic Condenser, there is a wheel of stops to select from built in. There are also stops which allow different types of oblique illumination by using various patterns such as a crescent-shaped opening. Simple stops can allow dark ground illumination at the lower powers, but for high power dark ground illumination, a more sophisticated system is required. Depending on the condenser, the swing-out filter holder could have different diameters, hence the support of the stops was made in different diameter to fit the condensers in question. Below the stage of the microscope is the substage. This area, sitting between the mirror or light source, and the stage, can be simple or complex. The simplest substage apparatus consists of a fitting which holds an aperture to regulate the cone of light reflected up through the stage. The basic type of substage housing is a ring attached to the bottom of the stage. In its more complex form, it is an adjustable housing that can be moved up or down and centered in the optical axis of the objective. In the most sophisticated forms it can also have a calibrated rotation mechanism as is seen on the Grand Van Heurck Microscope in this collection. This housing can contain a condenser, or a polarizer, and in its ultimate form has provision for regulating the diameter of the light passing to and from the condenser. Some housings have adjustments for purposely creating a off-center light path. Many have a provision for adding a stop or filter under the condenser. An optical element or group of elements located under the stage, and used to concentrate light from a mirror or other light source so that the light is focused on the specimen. Further improvement in resolution can be obtained by using achromatic and aplanatic optics for the condenser, just as in the objectives. 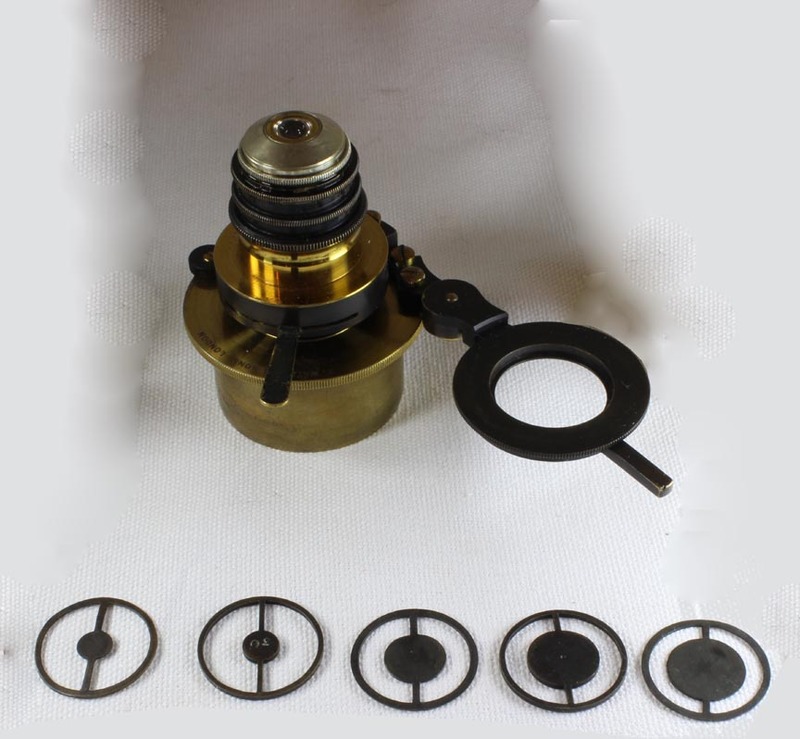 Good examples of the various types of substage condensers can be seen in the accessory section of the Grand Van Heurk Microscope on this site. A small cylindrical container, housing mica cover slips ('talcs') on one side, and brass retaining clips ('circlips') on the other, with screw-on caps at each end if ivory, or one end if brass. Most were made of ivory but occasionally in brass. They could be quite plain, as the example to the left, or like the one shown to the right, have fancy turned caps. The talcbox to the right measures 20 mm in length and 12 mm in diameter with the caps having a slightly larger outer diameter. Talcboxes were commonly supplied with screwbarrel microscopes,(like this one), as well as Culpeper-type microscopes. Illumination of an object from above, which may be from an external light source such as a SIDE REFLECTOR, or from a vertical illumination device. The illumination can be axial (parallel to the optical path), or oblique to any degree, depending on the way the light is directed on the object and the desired effect. Some opaque objects are best illuminated obliquely, while for other purposes purely axial rays may be prefered. Illumination by light passing through a transparent or semi-transparent specimen. In simple terms, the distance from the eyepiece to the objective. Microscope objectives are designed to work best with specific mechanical tube lengths (MTL). The mechanical tube length of an optical microscope is defined as the distance from the nosepiece opening, where the objective is mounted, to the top edge of the observation tubes where the eyepieces (oculars) are inserted. The optical tube length (OTL) is a slightly different measurement that varies with the eyepiece and objective used. This measurement is taken from the back focal plane of the objective (usually located somewhere inside the barrel of the objective housing), and the primary image plane of the eyepiece, which is usually about a cm below the top of the optical tube. To calculate the magnification of a given objective, one needs the focal length of the objective and the optical tube length. Magnification of an objective (power)=OTL/FL for the objective. The total magnification of a compound microscope is then the objective power times the ocular power. Since the OTL will vary even with type of objective, two objectives with the same focal length will magnify to a different degree if they have different optical designs. Tube lengths were standardized to different lengths depending on country and time period. The most recent finite standard, set by the Royal Microscopical Society, was 160 mm until it was changed to infinity in the 1980's. In this system a correcting lens known as a 'tube lens' is needed to allow focus. The magnification yielded by the objective with infinity corrected systems is the quotient of the focal length of the 'tube lens' divided by the focal length of the objective. For example, in a microscope system with a tube lens having a focal length of 180 millimeters, a 9 millimeter focal length objective will project a 20X magnified image onto the plane of the eyepiece diaphragm. A type of mechanical stage in which the right-left and forward-backward controls are concentric, eliminating the need to move the hand when controlling a different axis. It also allows both knobs to be turned simultaneously to allow movement in a diagonal direction. This type of control is found on many instruments on this site including the Grand Van Heurck microscope. Vellum(arrow) is a type of parchement, a paper-like material made from goatskin. It was seldom used to cover the outside tubes of microscopes, but was a common covering for early drawtubes or the inner sliding optical tube of older microscopes. It was commonly dyed green. Old vellum which has not been dyed appears to have a tannish tint. The outer tube of this culpeper type microscope is covered with shagreen. A system of viewing an opaque object in which the illuminating light is directed towards the object from the same direction that the image is being viewed from. This may be accomplished by the use of a VERTICAL ILLUMINATOR, or, in more modern instruments a light source that surrounds the objective. Vertical illumination is one type of TOP LIGHTING, but requires a light source that is oriented vertically, not from the side or an angle. A device for supplying vertical illumination, a form of episcopic illumination. The earliest type simply used a thin piece of glass, like a coverslip, angled at 45 degrees within the device which was usually placed on the nosepiece, just above the objective. Light could then enter from the side and be reflected down towards the subject, while the light reflected from the subject would pass through the reflector back up the optical axis to be viewed in the usual way. Other types of vertical illuminators used tiny prisms in the center of the device, the majority of the reflected light then passing around the prism up the tube. Vertical illuminators are still used today, but make use of specialized coatings to enhance the light paths desired, and reduce light paths that degrade the image. Further improvements included fittings such as iris diaphragms and condenser lenses to permit reflected Kohler illumination Modern vertical illuminators also have built-in electric light sources which is very convenient when the optical tube rather than the stage is being moved for focusing, as using an external unattached light source in this situation requires adjusting the position of the light every time the focus is changed so that it continues to line up with the side opening of the vertical illuminator. The distance between the end of the objective and the object being studied when the object is in focus. In general, the working distance shortens as the magnification increases. Special long working distance objectives have been developed though, to increase this distance so as to allow more flexibility in working with the subject being studied.